SWEET APPLE, the band of rockers featuring J Mascis (Dinosaur Jr., Heavy Blanket), Tim Parnin (Cobra Verde, Chuck Mosley), John Petkovic (Cobra Verde, Death of Samantha, Guided By Voices) and Dave Sweetapple (Witch, Eerie), will release their new album, Sing the Night in Sorrow, on July 28 via Tee Pee Records. 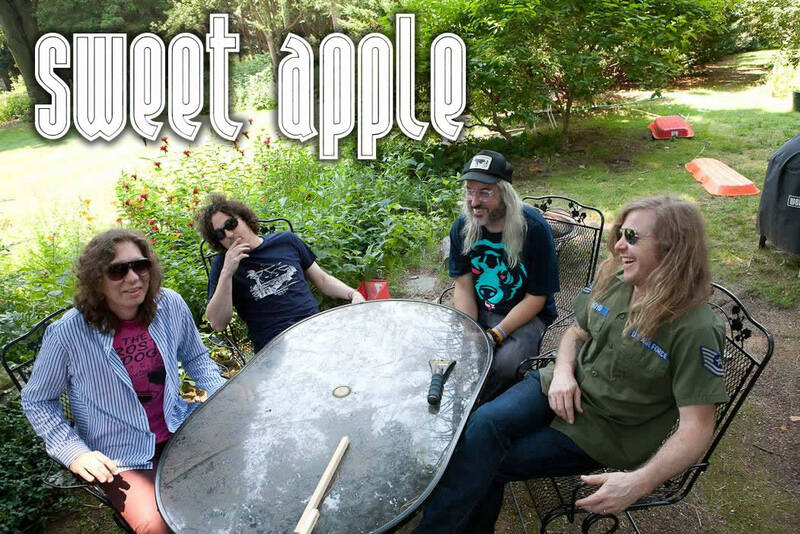 SWEET APPLE collaborated across several state lines to create the follow up to their critically acclaimed 2014 release, The Golden Age of Glitter, hailed as “throwback power pop that should soothe the soul of just about any riff-loving rock fan” by Esquire and one of the “Best Albums of 2014” by ABC News. Given the band’s geographical reach — its four members live in Massachusetts, Vermont and Ohio — it’s no surprise that SWEET APPLE’s inner circle has expanded outwards for this release. The four-piece have confirmed that guest musicians who have contributed to Sing the Night in Sorrow include Mark Lanegan (Screaming Trees, Queens of the Stone Age),Robert Pollard (Guided by Voices), Rachel Haden (Haden Triplets) and Doug Gillard(Guided by Voices, Nada Surf). Meanwhile, Stephen McBean (Black Mountain, Pink Mountaintops) will join the band on second guitar. Sing the Night in Sorrow explores themes such as longing and escape, darkness consumed by endless daylight, love amid lovelessness, faulty memory, alienation and distance. The LP is set to a musical palette that is wide-ranging, mixing atmosphere with impact. Sing The Night In Sorrow rolls out insurgent guitars, glitter-stomp, and orchestrated pop, at once timeless and contemporary. With more details – and new music – due to be unveiled in the coming weeks, SWEET APPLE are gearing up to leave their mark on 2017. Follow the band on Facebook,Instagram and twitter.